Since 2007 I keep on exploring, testing, evaluating ayurvedic centres and hospitals in India and elsewhere. After exchanging emails or talks in order to better know what could best fit your needs, we do the booking, but not only! 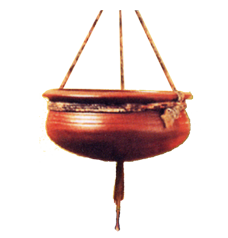 Do not hesitate to wander on our web site and discover the subtile resources of Ayurveda. This site is definitively not a "click and go", but a visual help, very useful to prepare your next ayurvedic cure with us. 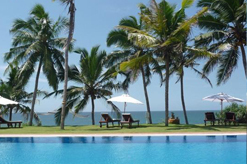 The NATTIKA BEACH RESORT is a beautiful ayurvedic resort wich has been built by the owner of Coconut Bay Beach in Kovalam. The medical team is top level (7 vaidyas) and the food, the yoga, the therapists, the house keepers, they are all together to bring you unforgetable souvenirs. 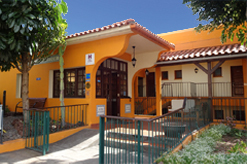 The NIKKI'S NEST AYURVEDA CLINIC is a middle size center located at the end of the very large Chowara Beach. Comfortable villas are nicely scattered in a gentle slope facing the sea. 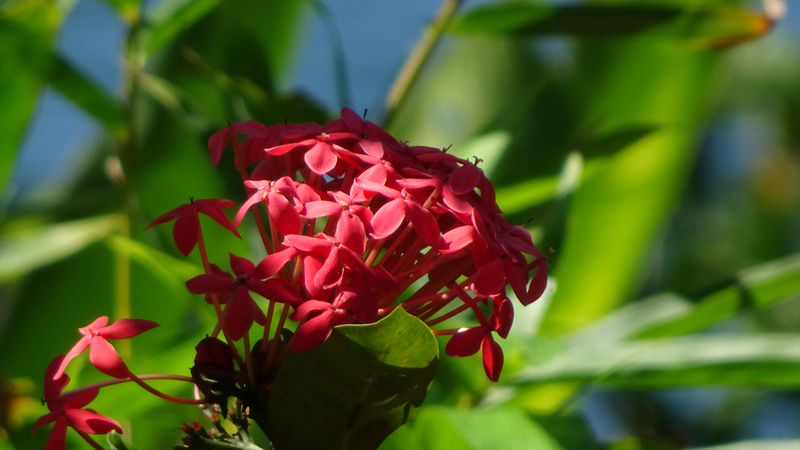 It is possible to combine your stay with DUKE'S FOREST LODGE , 40 km away on the mountains foot, in a rubber plantation. Cook, therapists, doctors, staff : all are providing care, from their heart and their skills. 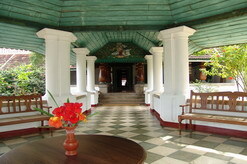 The BETHSAIDA HERMITAGE is a 97 rooms ayurvedic center, with so much space that nobody could guess its real capacity. Rooms are large, most of them with sea view. The center is in fact the economic lungs for a 1400 pupils orphanage and school located in the same property. 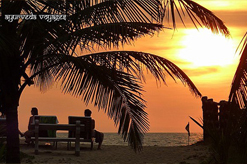 The LINTA's BEACH RESORT is a small center (10 rooms) created in 2015 by Dr Linta and her husband Sunil. The “DUKE'S FOREST LODGE” is a remote and quiet place in the jungle, facing mountains, crossed by a wild river, in a rubber trees plantation. 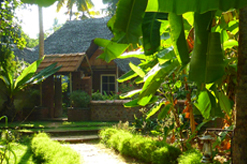 It is a joined property with Nikki's Nest in Kovalam, and it is there where are made all treatments ils. 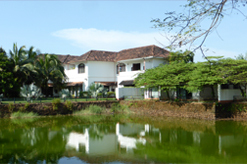 The Ayurveda Village is a dedicated enclave to ayurvedic curists inside of the Poovar Island Resort one of the most famous resorts in INDIA and in Kerala. Furniture and landscape are equal to the quality of treatments, comfortable and peaceful, full of care. 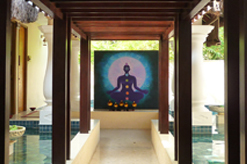 The CARNOUSTIE AYURVEDA is a very luxury center wholly focused on Ayurveda, which easily proofs that both can live together well. The SITARAM BEACH RETREAT is a new venture from SITARAM laboratory, initiated by HH the Maharajah of Cochin Sree Rama Varma XV in 1921. It is located on the sea shore, by a wonderful quiet and large beach. There is a lot of space to relax, although the number of rooms is reduced (10 rooms only), but the medical quality of treatments and diagnoses is top; it is mostly dedicated for people getting real helath problems. The RAJAH BEACH HOSPITAL is a center with a small capacity (10 rooms now, since the building of RAJAH ECO) on a beautiful and remote beach. Medical programs are identical to Rajah Island Hospital, Rajah Acre Hospital and Rajah Eco Beach. It was the first ayurvedic hospital to be certified NABH by Indian government. 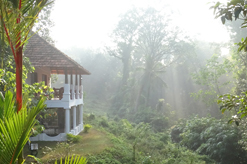 The MITRA HERMITAGE RESIDENCY is located between Kovalam and Trivandrum, on the bank of the local backwaters. It's more like a clinic-guest-house than a resort, and there are not mùany rooms, but for budget rates, you get the benfits or a genuine and attentive Ayurveda with real care. The SREECHITHRA created by Dr MADHU, teacher at Thrissur Government Ayurveda College, expands, but on the sea shore and by the beach. This is a small unit (actually 8 rooms only) for those who wish a genuine Ayurveda with modern standards of accommodation. The Centro de Cura Ayurvédica ASHOKA is a rarity in Europe because it offers real panchakarmas driven by vaidyas from Kerala who have been living there permanently since its beginnings in 2012. 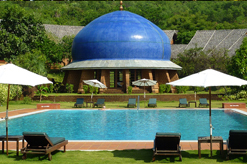 A great way to discover Ayurveda just a few hours away by plane. The RAJAH ECO BEACH is an ayurvedic hospital (58 rooms) by the sea and which opened in January 2018 close to the RAJAH BEACH HOSPITAL. 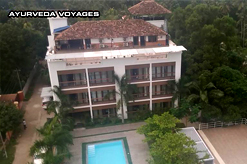 Treatments, vaidyas, therapist, are common to the two centres and there is a swimming pool for those who'd like to feel some fragrance of vacations. 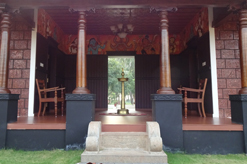 The SWASWARA, is a resort out of range, located in a very famous beachdesigned in the shape of a Omkara, the graphic expression of the sacred sound OM. 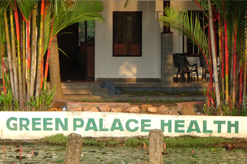 The GREEN PALACE HEALTH RESORT is a small ayurvedic centre recently open on an island in the Backwaters, surrounded by paddy fields and water. The location is magic, they even managed to build a swimming pool. 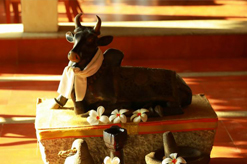 The MEKOSHA AYURVEDA is a small centre recently opened in a green location on the bank of the riverVamanapuram. The large and clear rooms have a little room attached devoted to additonal massages if needed. Giving priority to "care" - not related to money, but to human qualities - we have eliminated more than 130 ayurvedic centres and hospitals. The result is this short list, around twenty. For those seeking the onhes we have put aside, all pictures and web pages are still available on demand. reaisonnable size (small and middle size properties). Tariffs on this website are there to help future clients to evaluate budget competition between centres, but real rates are dependant on avialabilities, therefore, they can be used as a indicative information for discriminating those which are budget compatible from the others. 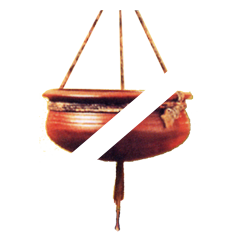 due to important differencies between offers - are on this website the only value for roughly comparing ayurvedic centres. At AYURVEDA BOOKING Ltd's, bookings are human (not robots) and are made by emails, including questions and answers about, availabalities and rates, but also health, pain and Ayurveda. Genuine Ayurveda is single person focused, and based on an old scientifical and philosophocal knowledge which is far away from prejudices and short sights,. It has been transmitted through the gurukulam where teaching was so deep that it could have lasted many years before the future vaidya get full insight on how to acurately practice. 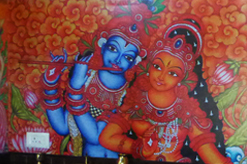 Nowadays it is taught in registered schools which deliver a BAMS diploma, but the unique non verbal transmission is over, and only inheart capacities of new vaidya, more over when they are still connected with traditional lineages, can bring part of the art of which samhitas are only the visual aspect. People not fully understanding the spirit of Ayurveda will reduce this knowledge to ready made recipes, and say "this is authentic, this is not authentic". The only authenticity is the vaidya himself, that's all. When you are told that swimming pools, beaches, mattresses on dhronis, eating meat, fish, etc... are anti-ayurvedic, there is part of truth, sure, but it is globally wrong. Everything should be related to its context and the involved individual koshas (layers): psychological (manamayakosha), energetical (pranamayakosha) and cellular (annamayakosha). In most centres hosting wellness tourists, to speak true, there is a big part of business, and affirmation about authenticity may easily be some marketing argument, no more, then it is important for those who are expecting some real health care to discriminate. 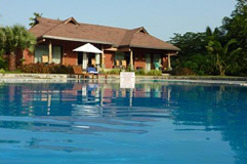 AADITHYAA LAKE SIDE RESORT, AMAYA HILLS, AMAYA LAKE, ANANDA SPA IN THE HIMALAYAS, ANANTYA RESORT, ANHC SALIGAO CENTER, AYURBAY BEACH RESORT (fermé), AYURKSHETRA, AYURVEDA YOGA VILLA, LAKESONG RESORT, AYURTHEERAM AYURVEDIC RESORT, AYURVEDAMANA POOMULLY, AYURVEDA MANA PERUMBAYIL, AYURVEDAGRAM, BACKWATER RIPPLES, BANGARAM ISLAND, BARBERYN BEACH AYURVEDA RESORT, BARBERYN REEF AYURVEDA RESORT, BENTOTA AIDA AYURVEDA, BIG BANANA ISLAND RETREAT, COCONUT BAY BEACH RESORT (fermé), CURE MONASTERY, DANUBIUS HELIA HEALTH RESORT, DUNE, EDEN GARDEN, ESTUARY ISLAND, GANESH AYURVEDIC CENTER, GAYAVEDA, GODS OWN COUNTRY RESORT, HARIVIHAR, ISOLA DI COCCO, JETWING AYURVEDA PAVILIONS, KADAVU, KAILASH BEACH RESORT, KAIRALI AYURVEDIC HEALTH RESORT, KANAN BEACH RESORT, KRISHNATHEERAM, KUNNATHUR MANA, LAKE PALACE, LAKE RESORT, LEELA KOVALAM, MATT INDIA, LE PONDY, AYURVEDA MANA PERUMBAYIL, NAGARJUNA AYURVEDIC CENTER, OM BEACH RESORT, RAJAH HEALTHY ACRES, REGANT LAKE VILLAGE, SAARAM, SATSANGAM, SHAMANA, SOMA PALMSHORE, SREE VIVEKAANANDA AYURVEDA KENDRAM, SRI BUDDHASA AYURVEDA WALAUWA, THAPOVAN HERITAGE, THE FORTRESS, THE OCEANO, THE PRIVILEGE, TRAVANCORE HERITAGE, TURTLE ON THE BEACH, UDAY SAMUDRA, VASUDEVA-AAYUKSHETRAM, VISHRAM, WOOD HOUSE BEACH RESORT, YANTRA, ZURI KUMARAKOM.